Rheumatoid arthritis treatments can be complicated and certainly need to be tailored to the disease process and needs of each individual patient. There is no accurate way to predict the course of the disease. There are three general categories of medications used to treat RA. These include non-steroidal anti-inflammatory drugs (NSAIDs), corticosteroids, and disease modifying anti-rheumatic drugs (DMARDs). Because we have learned that a great deal of joint destruction can occur within the first two years of active rheumatoid arthritis, and certainly can occur even before changes are seen on X-rays, rheumatologists have shifted their attitude toward earlier and more aggressive treatment of RA. All medical treatments come with potential side effects and potential complications. In general, the more aggressive the medical management, the greater the risk for complications from the medications used. Non-steroidal anti-inflammatory drugs (NSAIDs) are used to reduce acute inflammation, decrease pain, and improve function. All of these drugs also have analgesic (pain-relieving) properties. Aspirin is the oldest drug in this class. Some of the drugs in this class have recently been removed from the market because of a possible link with cardiac disease. Remember, all drugs can have potentially harmful side effects and must be taken with caution. 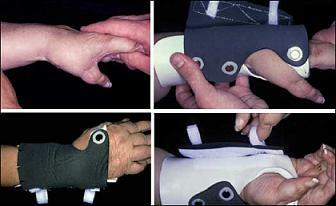 The drugs in this class can effect pain relief, but in general do not alter the course of rheumatoid arthritis. Straight analgesic (pain-relieving) medications, like oxycodone, are often necessary for short term pain relief. Corticosteroids are sometimes useful in early rheumatoid arthritis or while waiting for other, longer-acting medications to take effect. In general they are used for short periods only. 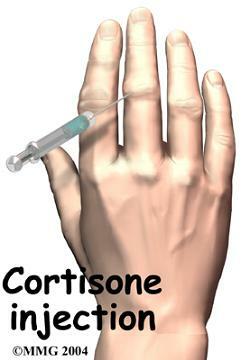 Corticosteroids can be particularly effective when injected directly into a “hot” joint. In the area of rheumatoid arthritis treatments, disease modifying anti-rheumatic drugs (DMARDs) hopefully not only improve the symptoms of active rheumatoid arthritis but alter the disease course and improve the outcome of RA. This is a complex and varied group of drugs. Their effect is often delayed in onset, so other drugs are used in combination during early treatment. Basically these drugs act on the patient’s immune system that is responsible for rheumatoid disease in the first place. Drugs in this class include methotrexate, Plaquenil, Azulfidine, Humira, Rituxan, and Imuran. Careful monitoring by your physician is required when using these drugs. Chronic Pain Management Support HERE! Information and support for all your chronic pain needs: Back, Neck, Arthritis, Headaches, Fibromyalgia and more. 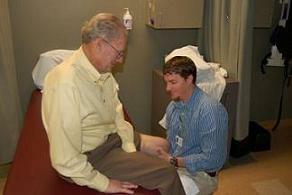 Physical and occupational therapy is important in the treatment of RA. Social and emotional support, both for the patient and for the family is crucial for total patient care. Be your own best healer. Achieve your own happy life balance between rest (during active RA periods) and exercise (during remission periods). Anyone can exercise in water, so find your own space for movement. Use of walking aids (cane, crutches, walker) can help keep you moving even during periods of active disease. Surgical intervention, particularly joint replacement surgery, is appropriate rheumatoid arthritis treatment when deformity from RA has occurred.